The Thermostat E is for people who don't want flashy tech on their walls. Since Nest unveiled its first smart thermostat back in 2011, they've always seemed like high-end pieces of technology that most people could only covet. After chatting with consumers, the company learned that some folks don't want yet another bright screen in their home. Others, meanwhile, almost felt intimidated by the ultra-sleek gadgets. That led to the creation of the Nest Thermostat E, a completely redesigned model with a lower $169 price (compared to $249 for the third-gen Nest), and which boils down its features into a much simpler interface and hardware design. Think of it as a Nest for the rest of us. The Thermostat E still looks like a Nest device, but it doesn't have a metallic ring or a bright phone-like screen. Instead, it features a plastic control dial that feels like ceramic, as well as a "frosted" LCD with a subtler, watercolor-inspired interface. Nest's higher-end thermostat almost always ends up being the center of attention in every room, thanks to its bolder design. The Thermostat E, on the other hand, is designed to blend into your decor. There's a "softness" to it that feels almost antithetical to what you'd expect from a Google-owned brand. Because the Thermostat's E screen is focused on showing you the current temperature, it doesn't display the time or weather like its more expensive sibling. Nest also says it won't work for very complicated HVAC systems -- for example, if you have three stages of heating or cooling. For that reason, the company claims it'll work in around 85 percent of homes in the US, compared to 95 percent with the original learning thermostat. Otherwise, it packs in all of the capabilities you've come to expect, including the ability to control your home's temperature through the Nest app, as well as learning about your routine over time. The Thermostat E also comes with a preset schedule, which will save you money even if you don't manually tell it when you're leaving the house. While it might seem a bit odd for Nest to announce a $169 device that's almost entirely as capable as its $249 flagship thermostat, the company doesn't see the two as competitors. Instead, it views the Thermostat E as a way to open up to a new batch of consumers who are potentially more price-conscious, and who don't necessarily want a flashy screen on their wall. In some states, you'll also be able to get rebates just for using a Nest device, as well as discounts for signing up for peak-power-reduction programs. Thanks to their energy smarts, Nest's Julia Deluliis says the company's thermostats have saved more than 14 billion kilowatt-hours so far. Given its current sales trends, and taking into account this cheaper model, the company believes it'll be able to reach a whopping 100 billion kilowatt-hours saved within the next four years. 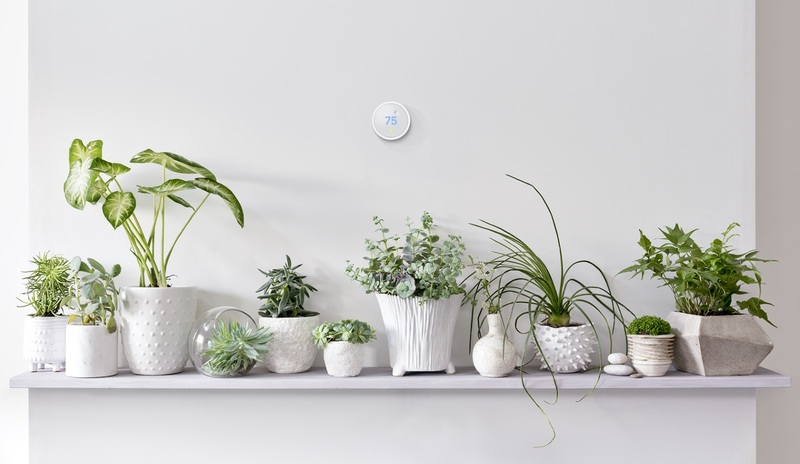 While things haven't been entirely rosy for Nest -- it lost its renowned co-founder and CEO, Tony Fadell, a few years ago, and suffered through a handful of so-so products, like the recent IQ camera -- the company is still a rare success in the smart home market. And with the Thermostat E, it has another chance to show how that category can be genuinely useful for consumers, instead of just a hyped-up tech dream.